It is eerily still, the only sound the wind whistling in the lift cables. There is no sign of the little stone café and refuge where we once spent happy winter afternoons downing vin chaud. 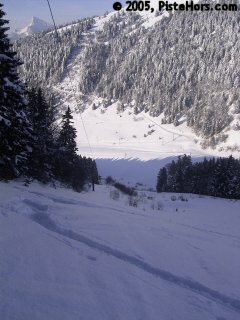 The familiar pistes where happy children used to play are deserted; covered in a foot of virgin powder. I pull up my collar to block out the cold winter air. The Col du Coq is a reminder of simpler times, ski resorts on a human scale before the MBAs at the Compagnie des Alpes took over and served us up with vast, homogenized ski domains all in conformance with ISO14001. A time when pioneers such as Lindsay, Pomagalski and Rossat could throw up a ski lift on a snow covered field. When ski resorts served their local community and a few intrepid pioneers from further afield. It wasn’t global warming that did for the Col du Coq. 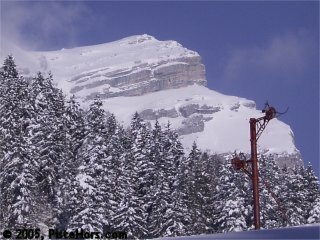 The ski slopes are situated at 1400 meters in the North facing Charvet bowl which holds its snow from the end of November to April. Instead there was a dispute over land. The lifts were on fields leased from a local farmer. When time came for the owners to retire an agreement couldn’t be found to package the site as a whole. 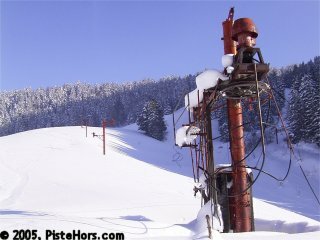 The local community of St Hilaire was interested but already had a ski domain on the sunny, West facing Plateau des Petites Roches. Since the area closed a decade ago brushwood has slowly begun colonizing the runs. We skied down to the resort after climbing the west side of the Dome d’Arguille. 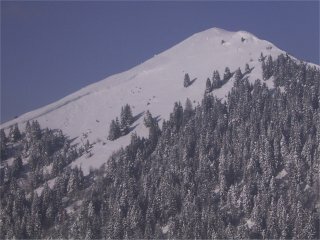 One of the easier peaks in the area. The lifts were supposed to be dismantled in 2000. But looking around it seems like it would only take a spot of grease to get them up and running again. After a short climb we reach the Col where a snow plough busily keeps the road open all winter, waiting forlornly for the day when weekend skiers once again whoosh down the slopes.